Once in a while, a car comes along that's so far out there, it's almost as if the manufacturer is wilfully raising two fingers to the world. Nothing had prepared us for the X6. As far as anyone except BMW could see, there was little indication of any demand for a luxury 4x4 coupe and no rival brand had dared dream up anything similar. That didn't stop BMW from building it and well-heeled customers from buying it. The point of the car may be difficult to discern but there are times when you just have to stop rationalising and take a vehicle for what it is. A big, imposing, expensive but well engineered bit of fun. The public perception of SUV vehicles was at an extremely low ebb in 2008, particularly SUV vehicles of the luxury persuasion. As far as the man in the street was concerned, they were inefficient, dirty, dangerous for pedestrians and being used on school runs in urban areas by rich individuals with only a tenuous control over their speed and direction. Most of this was extremely unfair but it still took bottle for BMW to drop the X6 into the debate like a hog roast at a Vegetarian Society picnic. Based on the more family-friendly X5 luxury SUV, the X6 arrived with a choice of four familiar engines beneath its vast four-door coupe bodywork. The xDrive35i model got a 3.0-litre twin-turbo petrol, the xDrive30d had a 3.0-litre diesel and the xDrive35d had a version of the same engine with a pair of turbochargers. At the top of the range was the 4.4-litre V8 petrol power of the xDrive50i, a car which could have been designed for the specific purpose of annoying the green lobby. Environmentalists had to recalibrate their pea shooters in 2009 when BMW put the icing on the X6 cake with the mighty X6 M. This added twin turbos to the 4.4-litre V8 engine to produce 555bhp and truly devastating levels of pace and agility for a 4x4 on this scale. There's the raised ride height and high seating position of a big 4x4 but the X6 is designed to produce a far more dynamic look and feel than the traditional luxury SUV. The exterior design reflects this fact with a tapering roofline and a long rear overhang giving the car the stretched profile of a coupe. The standard 19-inch alloy wheels also lend the X6 the look of something that has just leapt straight from a designer's sketch book. Flared wheel arches and big front air intakes give the car an aggressive front end that's among the last things anyone wants to see looming in their rear view mirror. The four-seater cabin is a different story from the snarling exterior. The BMW design themes were carried over from the X5, the build quality is good and there's a classy, minimalist feel to the environment. There's little to remind you that you're in such an extrovert piece of machinery. In terms of practicality, the X6 is less impressive. The car weighs well over two tonnes even with its smallest engines installed and it's 4.9 meters long, so you'd expect a prodigiously roomy cabin. In the end, space is good but not great, that swooping roofline cutting into rear passenger headroom and the boot capacity. The X6 comes with a healthy list of standard equipment that includes two zone climate control, part electric seat adjustment, a 6.5 inch colour display screen with iDrive controller and 19-inch alloy wheels. Go for the xDrive50i model and you'll get a unique 19-inch wheel design, self levelling rear suspension, Nevada leather upholstery and a more aggressive looking kidney grille and tailpipe combo. 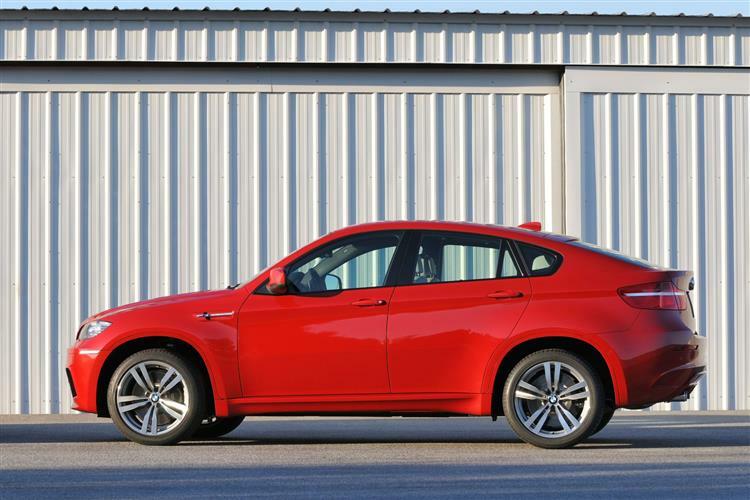 The BMW X6 has no known faults although it would be wise to check the underbody, exhaust and suspension for signs of damage from overenthusiastic off-roading. Over enthusiastic on-roading may well have taken its toll on the car too. The large alloy wheels are prone to kerbing damage and an enthusiastically-driven example can soon make mincemeat of its front tyres which, at around £200 per corner, could be a bill you don't want to be saddled with. There's quite a lot to go wrong with all those electronic systems on board but other than the odd tetchy sensor, it generally doesn't. (approx. based on a 2008 X6 xDrive30i) A replacement clutch is around £150, while front brake pads weigh in around £50 and an alternator (exchange) roughly £250. 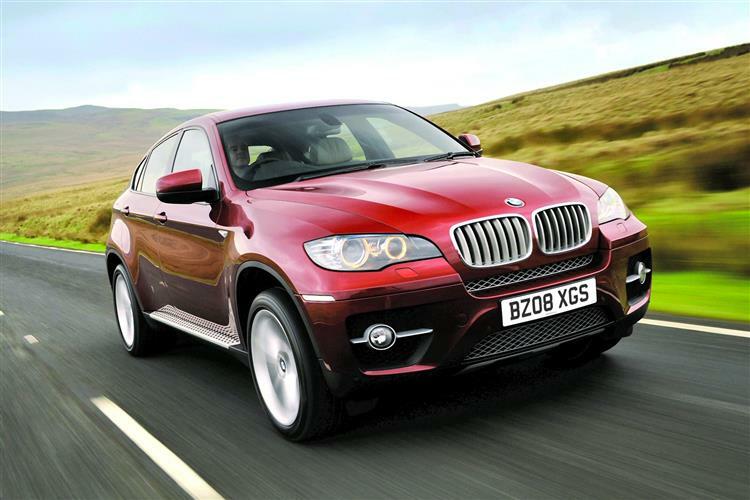 The genius of the X6 is the way it manages to stay so stable and poised on the road. It's tall, with a higher centre of gravity than some ground-hugging sportscar but for a vehicle of such proportions, it stays remarkably flat in corners, resisting lean and responding sharply to steering inputs. It's often said that a good handling car shrinks around you, feeling far more compact and nimble that its physical size would lead you to expect. That's the X6. Putting all the power from the beefier engines down on to the road is no mean feat but the xDrive 4x4 system manages it with little drama. Some models will also have the optional Adaptive Drive system that further improves the handling by constantly tweaking the anti-roll bar and damper settings. Of the popular diesel engines, the xDrive30d is good for 235bhp, which is enough to get it to 60mph in 7.8 seconds, and the xDrive35d's 286bhp renders it capable of punting the X6 to 60 in just 6.7 seconds, then onto 147mph. Go petrol and there's the 306bhp xDrive35i or the 408bhp xDrive50i which cover the 0-60mph sprint in 6.7 and 5.4s respectively. The brutal 555bhp X6 M has a 4.7s time for the 0-60mph sprint which will feel quite frightening. All models feature four wheel drive and Dynamic Performance Control. Whereas most systems use the brakes on the inner wheels to 'pull' a car into shape when the control system detects under or oversteer in a corner, Dynamic Performance Control instead sends additional wheel speed to an outer rear wheel to 'push' it around the corner. The effect is a smoother, quicker and less obtrusive way of exiting a bend. 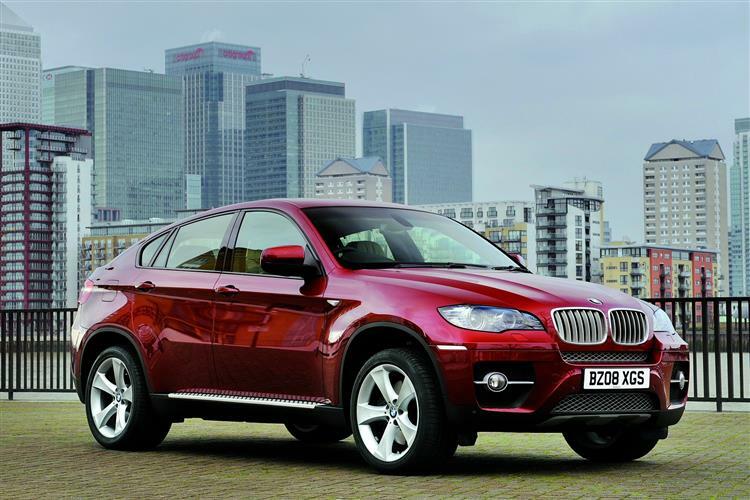 With the BMW X6, you get a vehicle that will attract as much attention as some supercars of its era when trundled along the local high street but one with enough space for the family and comfort levels that aren't far shy of BMW's executive saloons. It even handles well for a vehicle of its daunting size. This is the essence of the X6. In isolation, it does a lot of things extremely well but the only thing it really does better than any other vehicle you can get for the money is perplex.